Mahonia (Mahonia aquifolium) is a sturdy evergreen shrub that will enliven the winter landscape with bright yellow blooms and shiny serrated foliage that resembles holly. During the summer months, mahonia, also known as Oregon grape, will produce sweet-smelling, bright blue berries that birds love. A drought-tolerant plant hardy in USDA zones 7-9, mahonia isn't difficult to propagate. Take stem cuttings from a healthy mahonia bush in summer. Take a 4-to-10-inch cutting from the tip of a mahonia stem. For best results, take the cutting from a young, tender stem no more than a year old. Make the cut just below a leaf or bud, using a sharp, clean knife or garden shears. Fill a container with a mixture of half sand and half peat moss. If the container doesn't have a drainage hole in the bottom, make a hole with a sharp knife or a nail. Moisten the potting mixture with a watering can or spray bottle so that the mixture is damp through but not dripping. Strip the leaves from the bottom half of the mahonia stem. Place about 1 tbsp. of powdered rooting hormone on a piece of waxed paper. Dip the cut end of the mahonia stem in the rooting hormone. Discard the unused rooting hormone. Plant the lower 1/3 to 1/2 of the mahonia stem in the potting mixture. Be sure the leaves are above the soil. Pat the soil lightly around the stem so the stem stands upright. Cover the container with a clear plastic bag, and close the bag with a twist tie or rubber band. The bag will keep the cutting warm and humid for several weeks. Place the container in bright, indirect light. Avoid windowsills, which are often too hot during the day and too cold at night. Air temperature should be between 60 and 65 degrees, but the stem will root faster if the container is placed on a warm surface, such as the top of a refrigerator. Check to see if the stem has rooted after three or four weeks, as the stem can root anytime between three weeks and four months. To check for roots, lift the stem carefully from the soil with a table knife. If the stem hasn't rooted, replace it in the soil. Remove the plastic bag when the roots are 1 to 2 inches long. Move the container into bright sunlight. 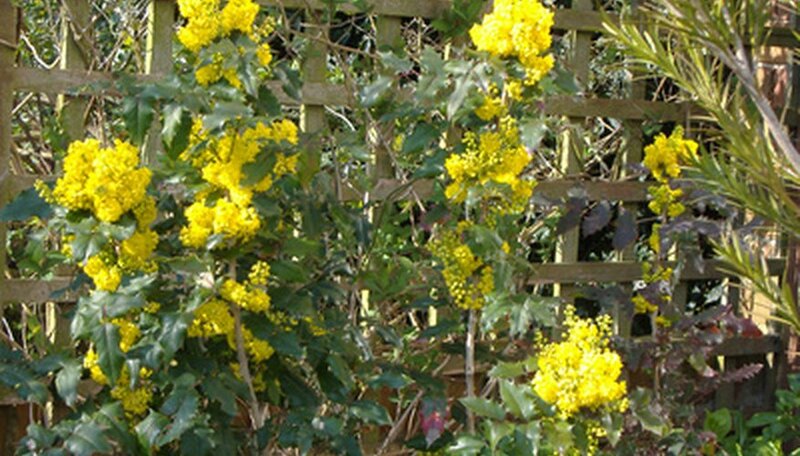 Allow the young mahonia bush to mature at least until the next spring before planting it outdoors. A larger plant will be more likely to be successful when planted outdoors. It's a good idea to take several stem cuttings, as success is rarely 100 percent. Plant the cuttings in the same container as long as the leaves aren't touching. When the roots are 1 to 2 inches long, plant each stem in an individual container.